Today, businesses across every industry expect an unprecedented level of speed and innovation from the SaaS (software as a service) platforms they invest in. The more a platform is able to automate rote tasks and improve the efficiencies of its user base, the more “sticky” it becomes - improving recurring revenue and driving user acquisition. For many SaaS companies, this means integrating AI to automate functions from answering questions to improving search. In this post, I’ll share four different SaaS companies that have already implemented AI into their platforms and how it’s helped them improve their business! Zendesk is a customer service and engagement platform that companies use to manage support, create knowledge bases, and more. However, answering every customer inquiry swiftly proved difficult to scale. 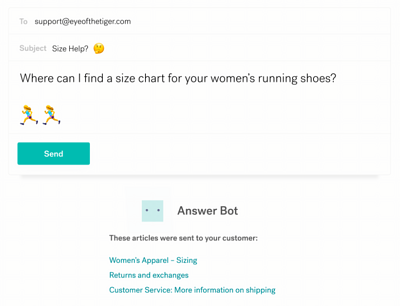 To augment this, Zendesk launched Answer Bot, which works alongside support teams. The bot uses machine learning to help answer questions with content from the knowledge bases created by the companies using the platform. The answers it provides are tailored to each customer’s question and it knows to loop in support agents to offer the customer a human touch if it’s stumped. This frees up customer support agents’ time, so they can focus on what they do best: solving complex problems and building better customer relationships. Influencer marketing has skyrocketed over the past few years. With companies investing more and more dollars into working with influential creators across a variety of platforms, it’s vital that these marketers are able to efficiently find the most effective people to work with. However, that is easier said than done when there are millions of users across multiple platforms to sift through. That’s where AI comes in. By implementing Clarifai’s AI enablement platform, AspireIQ was able to build an influencer recommendation engine. 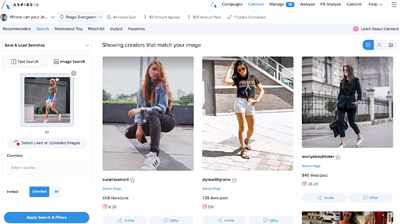 Marketers who use the platform are now able to automatically search and filter through millions of influencer posts to get suggestions of the perfect influencers for their campaign. Marketo is a marketing automation platform used by marketers for tasks ranging from email marketing to lead management. AI has become a key part of their platform, providing even more automation opportunities for the marketers who rely on the software. 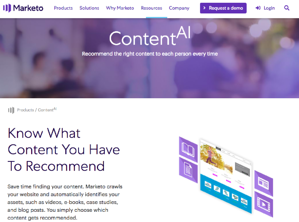 For example, their ContentAI tool applies machine learning to the content delivery process. It selects the next piece of content of interest to a customer, based on their previous choice, and can, for example, tell you the top 10 most interesting pieces for a particular audience. It does this in real-time and learns as the customer continues to engage, getting more and more information about their preferences. This saves time, energy and more importantly, provides a more personalized and engaging experience for customers. Foap is a fast-growing photography platform that connects brands with the images they’re looking for. However, with thousands of new images being uploaded by photographers daily, consistently tagging images to make them easily discoverable by companies proved difficult. For example, an image of a dog might be tagged “dog,” or it might be tagged “poodle,” “animal,” or “fuzzy waggy tail fur baby.” They needed a solution that could “see” each image and apply the appropriate tags accurately and consistently. Foap now uses Clarifai’s computer vision technology to organize and curate user-generated content and to automatically tag photos users upload with relevant keywords. Now, when a user uploads an image to Foap, the app automatically suggests relevant tags for every image. Users still have the option to add their own tags as well. That way, Foap ensures consistency across user-generated content from different creators but also allows for creativity and flexibility. Clarifai’s tags are also baked into the Foap's search, so brands can find precisely what they’re looking for. Now, not only is it easier for photographers to manage their portfolios and make their offerings more attractive, it’s also easier to surface the right content to buyers so they make more purchases. This saved 40 hours per week in manually adding keywords and moderation. “Clarifai is now the absolute core of Foap’s tagging mechanism, making images findable in the Foap marketplace,” David Los, Foap’s Founder and CEO, said. It’s clear AI is worth investing in for SaaS products. With that in mind, the big question for product and tech leaders at these companies is whether to build or buy an AI solution. Regardless of their final choice, one thing is certain: we’re just seeing the beginning of how AI will impact the SaaS world.